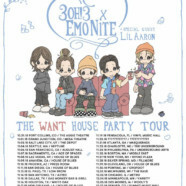 3OH!3 and Emo Nite LA have joined together to announce a tour like no other – The WANTHouse Party Tour!!! Featuring special guest lil aaron, these shows are going to be an actual house party. Fans are going to be able to be a part of each night without the typical constraints of set times and with an opportunity to really interact and connect with artists, just as if you were throwing this party in your own living room. Nathaniel Motte and Sean Foreman of 3OH!3 shared that“We want to include people from different backgrounds, walks of life and foster an environment that breaks down the barrier between the artist and fans. We want to be able to throw a party, celebrating 10 years of WANT and bring the unique energy of Emo Nite along with the energy we have always had.” Pre-Sales begin today with all general tickets on-sale Friday, August 3rd at 10amLocal Time. For more information, please head to http://www.3oh3music.com/.